Living in container houses can involve many different types of experiences. Those living in this home must enjoy sunny days and the fresh outdoors. Large glass garage doors raise and lower for whatever weather dictates, but the ends of this massive shed are what keeps the eye interested. Bright orange containers work to provide walls and private space where there otherwise would not be any. A large patio area outside of the loft create more square footage and living space and keep it from feeling too cramped. Complimenting each other perfectly, the orange of the container and the blue of the dining chairs provide a classy, pre-modern funk. Stone and wood help this container house blend in and be nearly unrecognizable. The container itself is nearly all windows. Having thick, vibrant curtains to act as a wall barrier is ingenious and gives a unique flare to the rest of the house. Storage container homes have the naturally flat roof, making them perfect candidates for rooftop patios. This home acted on that and has an open patio design with high handrails made of wood matching the patio below. In warm tropical weather, keeping things open to the light and warmth is a great way to utilize what nature already provides. The outside view of this container house showcases what gives it uniqueness. “Storing” the storage containers indoors is not only a fun play on words, but a great way to highlight statement colors and shapes. In areas that have lots of rain, it might be necessary to have a slightly slanted roof. This home keeps the roof shape in the large front windows, creating an eye-catching contrast of shape. The designer also played on the presence of metal, having the outer shell be more shed-like, matching the interior metal of the storage container. Storage container homes can also have fun with hillsides, whether man-made or natural. This home features an inner courtyard, but the really unique part is the second floor leading right into the yard. Playing with height in this way not only increases the visual value of the house, but also utilizes space very well. On the side, a walkway connects the two halves of the home. While it may not be the best connector in cold or rainy weather, it certainly is beautiful in the sun and warmth of summer. 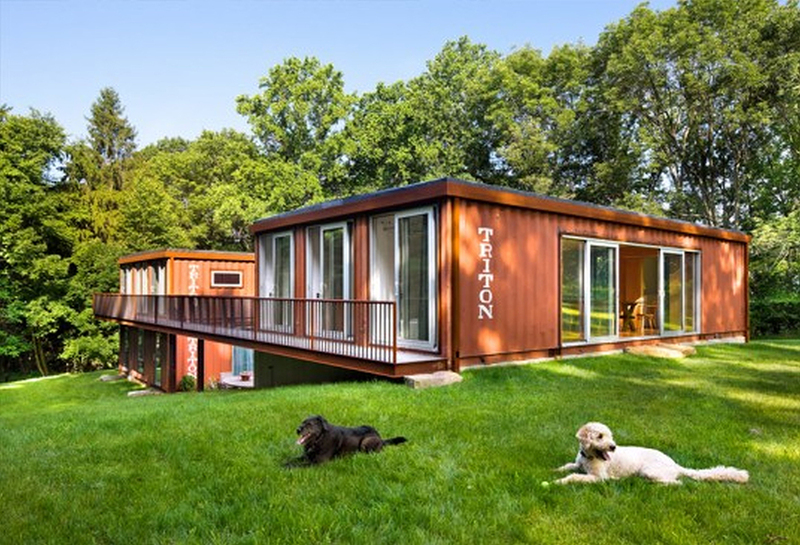 Some shipping container homes don’t even end in the shape they began. This home, for example, has really only one area that the viewer can distinguish the container in. Otherwise, the home creates it’s own unique shape and design. Rectangular windows of various width and height keep the face of the house interesting, and the contrast of black and white creates a smooth and clean appearance. The many windows and upper patio connect the closed off space to outer light and keep it modern and fresh looking. When the area for the home is narrow like this, having a deep-set home style can save on square footage. 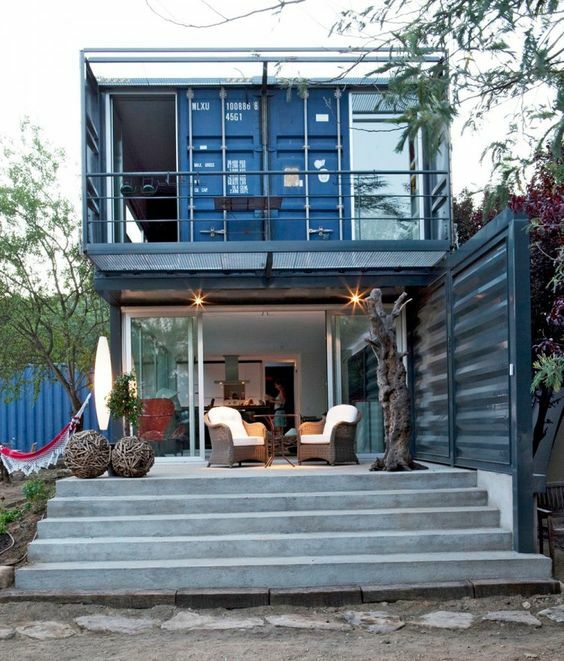 This shipping container house brings in the best of modern and natural home decor style. A craggy tree trunk can be seen jutting out from the cement patio, giving a twist of natural lines. But the second floor porch above is metallic, cold, and streamlined. Likewise, the circular wooden décor balls on the patio contrast with the straight lines of the container ridges that backdrop the sitting area. Built right in touch with nature, a tree nearly overhangs directly into the porch and leaving the last step takes you directly to a natural flag stone walkway. 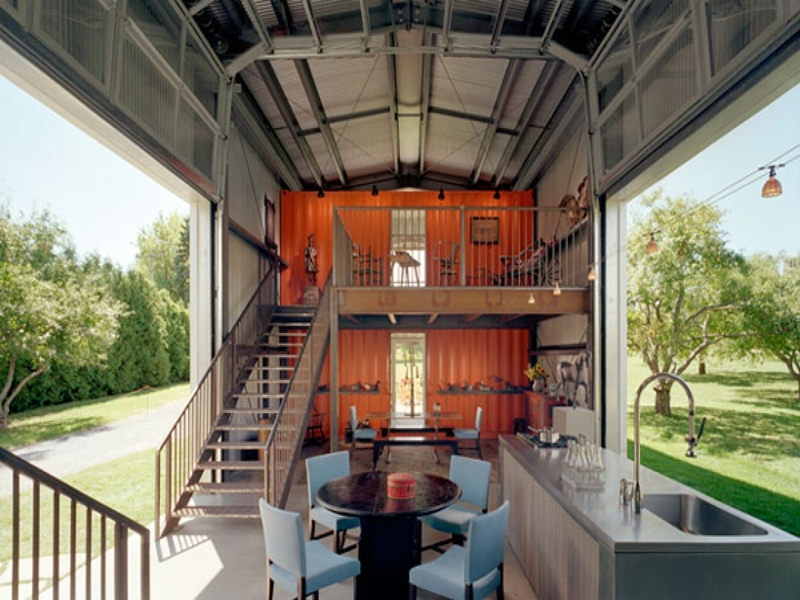 Storage container homes can either stand out or blend in. This one, however, takes the stand out approach. Covered with wooden slats to discourage the hot sun from warming up the interior, this home feels like a throwback to 60’s-style blinds. However, breaking up the pattern is a beautiful stretch of open glass windows and a wide door frame. The other side of the house mimics this design, and in all it creates an amazing, open space that gives breathtaking views of the surrounding countryside. Likewise, an open patio area is kept free from trees or other distracting objects, and allows you to enjoy the nature around you. 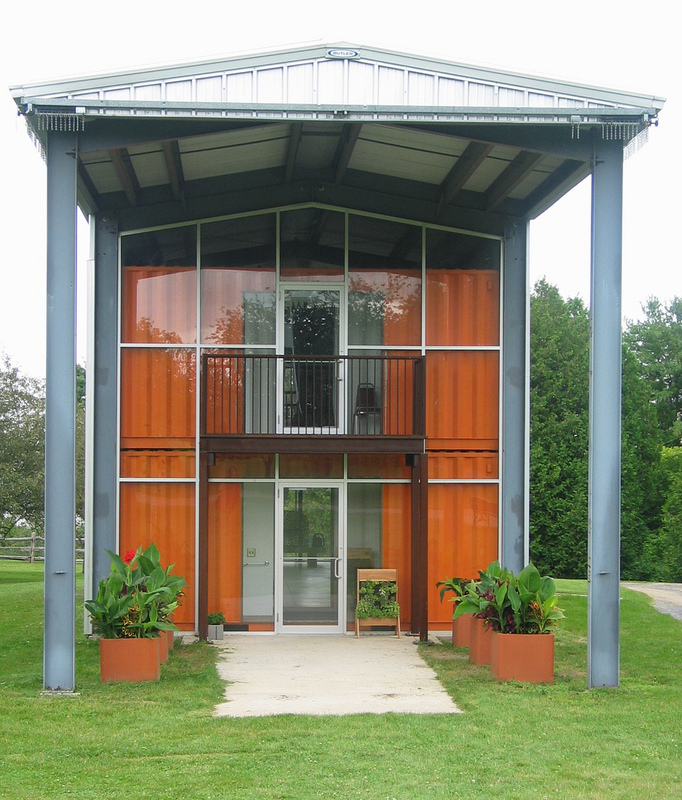 This shipping container house is a very simple structure and design. The touches of added complexity in the lettered posters and white wording on the side of the storage container add a nice touch. The tall windows let the eye travel around the interior. They also showcase the professional use of red as a highlight color, seen in the posters, couch, bedding, and overall container color. The patio remains uncluttered and simple and plays on the straight lines present throughout the rest of the design. 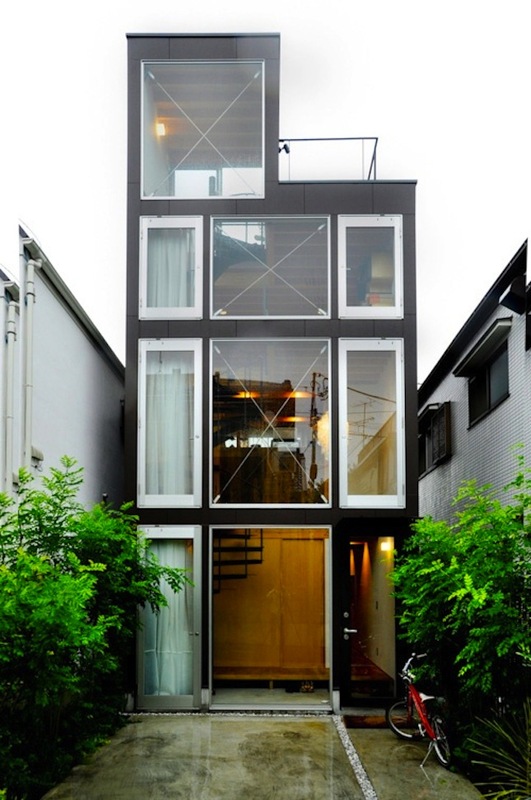 When it comes to exquisite container homes, this might be near the top of the list. Amazing shapes, colors, and textures are present throughout this house, and the overall impression is fantastical yet simple and fun. The smooth flowing lines of the circular area contrast just enough with the boxes, straight lines, and angles seen in the rest of the house. Almost childlike in color use, the blue and red make this home seem like it’s own art museum. Elevated and slanted roofs keep the rain from pooling but also give it height and dimension. 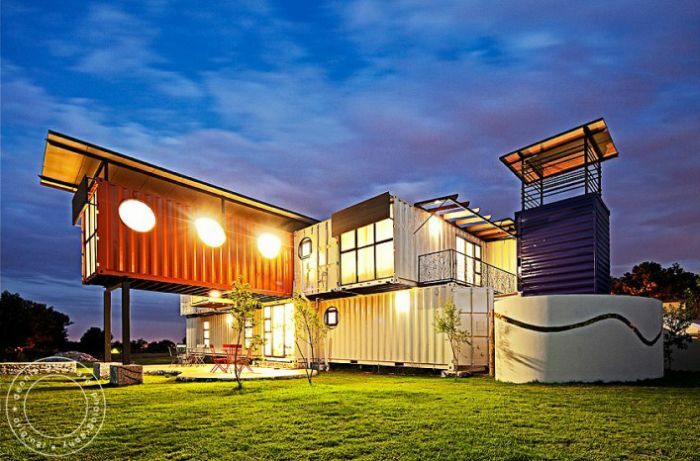 Overall, container homes have become a way for designers and home owners to express their personal taste and design preference. While they may be rectangular boxes, that doesn’t stop people from enjoying the chance to create open, airy spaces and fun, exciting shapes and angles. 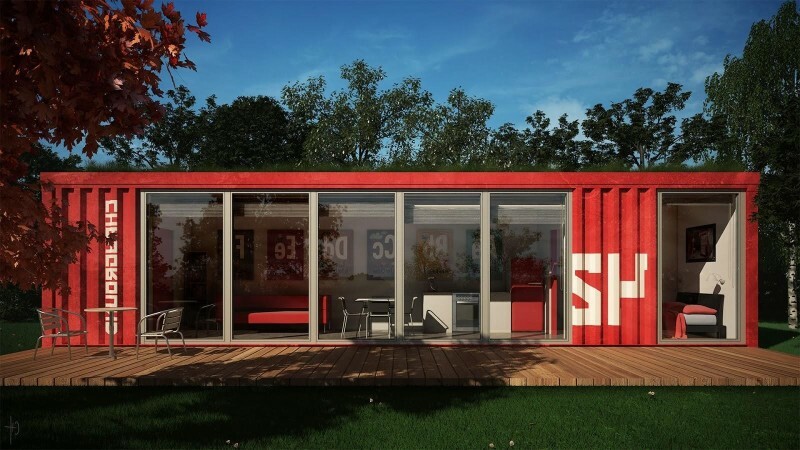 Shipping container homes are certainly only going to increase in creativity and allure. 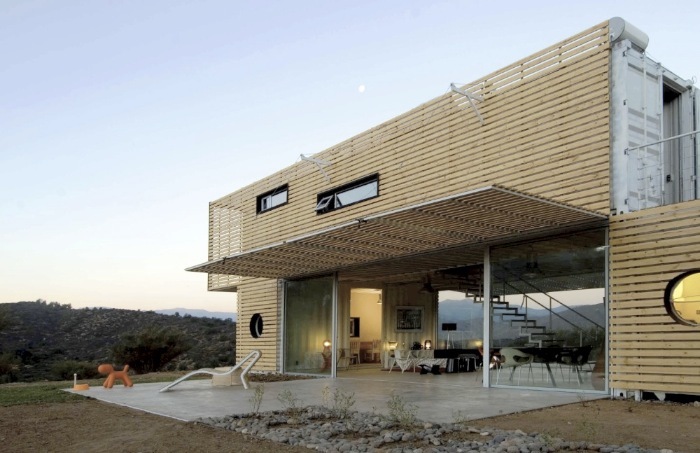 It is also evident that a shipping container house can be both eye-catching and practical. From factory-like indoor living spaces to those that embrace the surround wilderness, container houses seem to have no boundaries. The shape and dimensions of containers very enough to let the buyer choose what the overall structure will look like. Will it be in a tree or factory? Will it be elevated or stand on it’s own? These are questions only the designer can answer. But one thing is clear, container homes are the next wave of innovative and economical home construction. 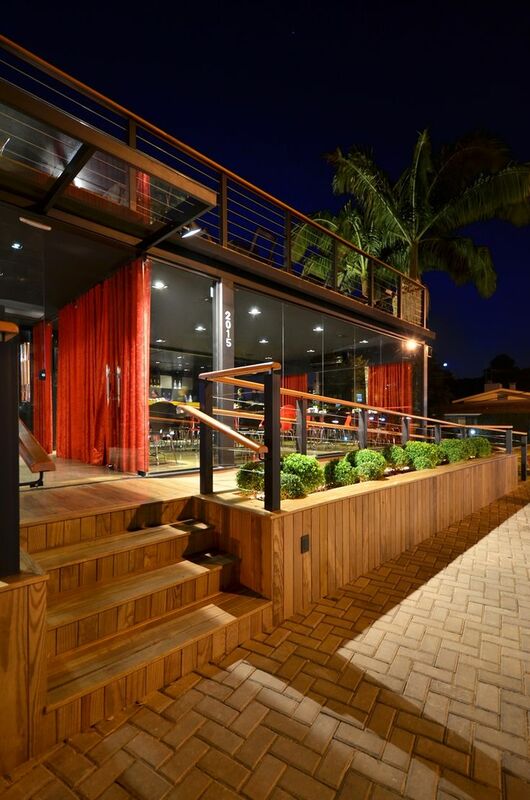 With all the different tastes and designs, a container house can be whatever you want it to be.